This still from a video skywatching guide shows how the penumbral lunar eclipse of Nov. 28 will slightly darken the full moon. The video guide is a monthly resource by the Space Telescope Science Institute in Maryland. Eclipses of the sun and moon go hand in hand, and the November night sky is about to see one. If an eclipse of the sun takes place, it will be preceded or followed by an eclipse of the moon. Generally speaking, if the solar eclipse is a total or annular eclipse — with the new moon appearing to centrally cross in front of the sun's disk — a lunar eclipse occurring two weeks before or after the eclipse of the sun will be relatively minor, with the moon only skimming the outer part of the Earth's shadow. That's what moon observes will see next week. There was a total solar eclipse visible from parts of Australia on Nov. 14 local time, and two weeks later, on Wednesday, Nov. 28, it will be the moon’s turn to undergo an eclipse. But as expected, it will be an underwhelming event since the moon will slide through the Earth’s tenuously faint outer shadow (called the penumbra) resulting in a penumbral lunar eclipse. The moon first touches the penumbra at 7:15 a.m. EST (1215 GMT). Theoretically, people living near and along the spine of the Appalachian mountain chain could have a chance to see the start of the lunar eclipse (from their point of view, the moon sets while the sun rises). But in practice it will be quite impossible for them to observe this, since most of the penumbra is such a light shadow that it makes no visible difference to the brightness of the moon. So toward the middle of the eclipse people living within the Mountain Time zone may see the northern rim of the moon experience the slightly thicker duskiness of the inner penumbra at 7:34 a.m. MST (1434 GMT) before it disappears below the west-northwest horizon. 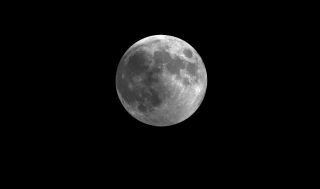 Observers living in Alaska (5:34 a.m. in Anchorage) or Hawaii (4:34 a.m. for Honolulul) will see the slightly dimmed moon shining high in the west-northwest in a dark sky. The last vestige of faint penumbral shading should disappear about 45 minutes later – just as the moon is getting ready to set along the West Coast. In the lunar eclipse timetable graphic accompanying this guide, if the moon has already set, then that particular event is listed as "Not visible" for your time zone. This chart depicts the penumbral lunar eclipse viewing times in the United States for the Nov. 28, 2012, lunar eclipse. An astronaut on the moon during this time might see an eclipse of the sun, but it would all depend on where on the moon our hypothetical moonwalker is located. From the crater Clavius, near the moon's lower limb, no eclipse takes place as that part of the moon remains completely untouched by the penumbra. In contrast, near the moon's upper limb, from Mare Frigoris ("Sea of Cold"), the Earth will appear to cover nearly nine-tenths of the sun's diameter; consequently, the brilliant solar illumination of the surrounding lunar landscape will turn somewhat more somber. And this is precisely what we're trying to see from here on the Earth when we concentrate our gaze toward the upper rim of the moon. If you snap a photo of the dim penumbral lunar eclipse of 2012 on Nov. 28 and would like to share it with SPACE.com for a story or gallery, send images, comments and viewing location information to managing editor Tariq Malik at: tmalik@space.com.